Stolen youth and hard fought freedom Sikh political prisoner Bhai Sarwan Singh Sarpanch has yesterday walked out of prison after 18 long, lonely and painful years. Sikh Relief’s Bhai Parminder Singh and Advocate Kulvinder Kaur were there to receive him at the gate of the notorious Maximum Security Jail at Nahba. Bhai Sarwan Singh Sarpanch, who was arrested back in 1990 from District Ferozepur, was charged under sections 302, 307 and the provisions of the internationally condemned and anti constitutional TADA Act. He was tortured and railroaded into prison, only being granted bail 8 months after his arrest on totally fictitious and false charges. The real torment began in 2000 when he was sentenced to life in prison for crimes he had not committed. Today he has been released permanently after 18 long years of harsh and unjustified confinement following a petition being filed by Sikh Relief Advocate Vinay Jindal and Vipin Jindal at the Punjab and Haryana High Court. The High Court heard the case in full and ordered the permanent release of Sdr Sarwan Singh. Having made the High Court order, the Home Ministry of India, has to then indorse the release for it to be carried out. And in yet another example of the inhuman stance and attitude to which the Sikh community has become so accustomed, it has taken no less than six months to issue the release documents. 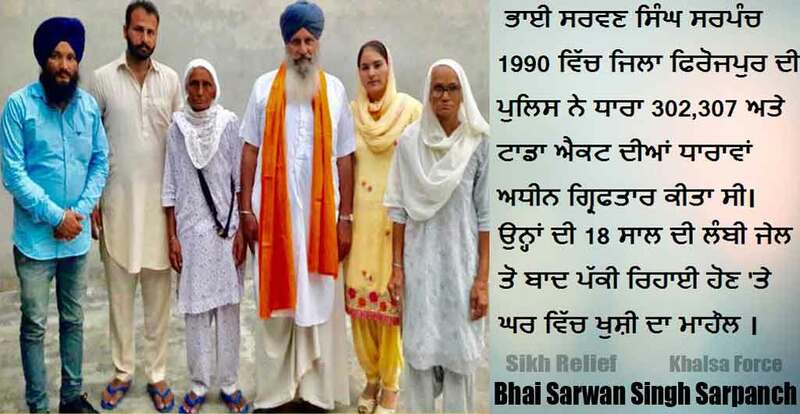 Sikh Relief is continuing to fight hard for the release of Sikh political prisoners and many more political prisoners are expected to be released in the coming time. We sincerely appeal to the Indian Government: if you are genuine and want to embrace the chance of peace and want for the Panjabi community to trust the intentions and sincerity of your parliament and forces. Obey your own laws, judicial system and processes. Only then will you gain the respect you crave as serious and genuine people. We wait to see if the Indian Government is going to behave like a democracy under law and stop delaying the processes of the law, but tonight as Bhai Sarwan Singh was being driven home by the Sikh Relief team there was a celebratory atmosphere awaiting Bhai Sarwan Singh at the home he hasn’t seen for 18 years.